It is not a secret that more men and women are having plastic surgery to improve the shape of their nose even when they risk having unwanted results that can end up costing a fortune and make the matter worse. The year 2017 shows no slow down on nose job demand. The social media and the selfie era, had made nose surgery the top procedure worldwide. While having a nose job sound the dream idea, everyone’s needs are different. In many cases a nose enhancer like NoseSecret could be the answer to avoid downtime from work, countless hours of nose contouring and running out your savings. Those complaining about having a bulbous nose tend to have a rounded nasal tip that can make the nose either too bulky or to wide disrupting the harmony of the face. NoseSecret helps by gently lifting the tip of the nose which instantly narrows the width of the nostrils. Creating a pointier yet harmonious look . The nose that is too wide: The majority of people sharing this trait complaint mostly that the nose looks too wide when they smile. NoseSecret main focus is to reduce the width of the nose by gently lifting each side of the nostrils making the nose to look more refined when smiling. The nose that has a minor hump or nose bridge-hump: Perhaps one of the greatest benefits of those who share this issue is that by gently forcing the tip to stay lifted, the look of the hump diminishes, creating the a more even look. The nose with a dropped tip: While this is one the less dramatic traits, it does bother greatly those who may be looking for a drastic change with plastic surgery but may see a non-surgical nose job procedure a more cost effective one. NoseSecret really help with this issue because it is easy to gently lift the tip of the nose in just seconds. The nose that is crooked: A crooked nose can be due to an injury or a trauma at birth. This imperfection tends to skew the nose to one side, creating a disproportion on your face. Most customers who have shared their experiences with us address this issue by using 2 splints of different sizes to straighten the side that is skewed. The nose is too small -need a taller bridge: NoseSecret creates the effect of having a taller nose bridge which is the goal of many with small noses. Each person is different and results may vary from person to person. “Having the chance to try a nonsurgical nose job alternative for such a low price with great results is a big deal “says, Kelly a long time NoseSecret user who was once considered a nose job to refine the tip of the nose. 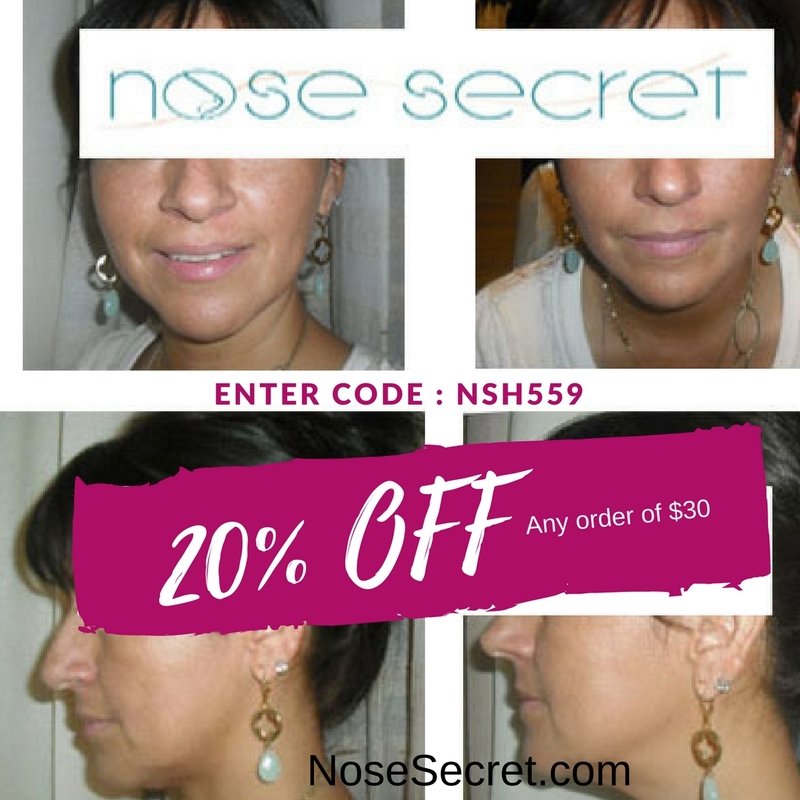 NoseSecret.- Instant Nose Correction that works. Nose Secret are a pair of curved plastic splints that you can manually insert and remove to give your nose tip a slimmer and lifting look. Learn more at NoseSecret.com – the brand you can trust!